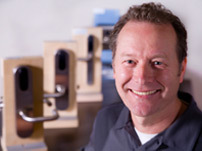 With 10 years experience in the locksmith trade already behind him, New Zealand-born David Barrett started Citiloc as an electronic lock company in 1985. Today, Citiloc is recognized as one of the premier integrated security system providers in Greater Vancouver, employing a growing and specialized staff in a 9,500-square-foot building in the Vancouver’s Railtown District, near the Port of Vancouver. We are proud of our our past accomplishments and at the same time we strive to take advantage of what’s available in the future. Like the industry itself, we’re evolving into the next generation of products and services. Our success comes from our unique background and skill set, focused exclusively on providing all–encompassing security solutions. We have a team of service technicians that are able to quickly respond to customer needs such as locksmithing or servicing existing systems, while the Systems Integration Group focuses on larger, new-construction or retrofit projects. Our approach to security is “holistic,” providing the full package – everything from supplying and installing the commercial locking hardware right through to the integration of the electronic access controls, video surveillance intrusion security, as well as the building automation and the computer network infrastructures. Contact us by phone (604-879-0404) or fax (604-879-0405) for more information.